I’m always looking for a fun new cocktail. Either one to serve to my guests, or one to try when I’m out – or home alone. I mean, you can’t serve your guests a new concoction that tastes horrible. That’s just bad planning, unless you never want them to come back again. This Snowball Martini is a total winner. The Snowball Martini looks totally wintery, but isn’t necessarily winter flavored. Now, don’t get me wrong, I love peppermint, milled wine, and those types of goodies, but there’s just something about that sneaky Snowball Martini cocktail that looks wintry, but tastes like a tropical vacation. Just like a real snowball fight, you’ll never see it coming. You will need a cocktail shaker for this recipe. A good home bar should have one anyway, but a lot of people don’t. I really like this set that has a shaker, a jigger (for measuring) and a strainer. This Snowball Martini looks like the perfect winter cocktail, but just like a real snowball, there's a surprise. The flavors are actually more tropical than winter. WHOA! Wet the rim of your chilled Martini Glass. 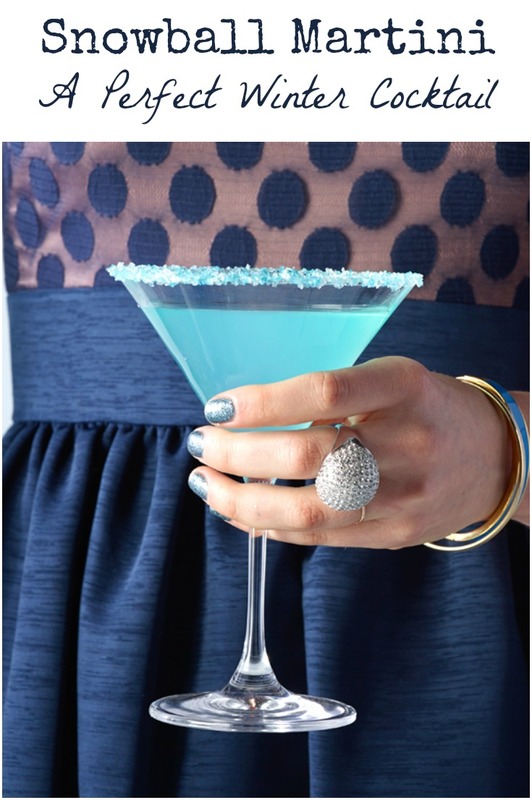 Dip the rim in blue and white sugar. Set aside. Add all ingredients, except the sugar, to the cocktail shaker. Shake well until chilled and well combined. Strain into your sugared martini glass and enjoy! Will you be serving this Snowball Martini at your holiday parties? This looks good and its pretty too! This looks awesome – I love the blue color. Great recipe! I think I will make this for New Years Eve!